It just depends what type of view you like. For example, I like focusing on team shape and the big picture, so I stand on the concourse to get as far away as possible, so I have the inexepensive supporters section tickets. If you're into the athleticism or heckling the refs, then sit on the field. If you want to drink and get rowdy, sit in the supporters section. In general, the west side is the corporate side and tends to have more of a busniessy crowd and more families. It is also slightly closer to the field. The east side is sort of more blue collar and the SS is in the southeast corner; it also has the mountain view as the backdrop. They're not real strict about checking tickets, so you can probably move around a bit if there is enough space (which there normally is). If you want to sit on the field and the online ticket system shows it as sold out, stop into the store/office in downtown CS on Tejon and Platte and they can probably hook you up. They are very friendly and the president of the club will literally just walk up to you and talk soccer sometimes. I woke up at 2:45 in the morning wondering what might have been. With wars going on around the world, civil unrest, a slimey political system gutting the middle class, the homeless, the hungry; the only thing that keeps me up at night is my local USL team. Margins are just so fine in the USL and in soccer in general. I thought both the Portland and the Seattle performances were worthy of points, maybe even 6 points if they were mistake free like earlier in the year. But they have to settle for 1 out of 6 against two teams that were, quite frankly, there for the taking. When the road team comes out aggressively, taking the game to the home team and going up 1-0 in both games as the Switchbacks did, 1 point is very much a disappointment. Once again, the effort was good. There were periods of very good play and SFC started well and controlled both games, which is all you can really ask for on the road. But the trend of scoring only scoring 0 or 1 goal and making defensive mistakes is continuing. It was now 8 games ago where they last scored 2 goals (USOC included). And the defense always has a gaffe in them. Gorrick made his 2nd or third goal costing mistake of the season late in the Portland game. The first Seattle goal wasn't really a mistake, it was just a nice redirection by the Seattle player off of a low ball into the box on a set piece. But I will blame the 2nd on Greenspan for putting the team down to 10 men. The loan of Greenspan is an interesting one. While he looked like maybe a bit of an upgrade on Phillips or Greer in the Portland game, he looked like a petulant child in the Seattle game. Even in the Portland game he was perhaps excessively vocal. Even at that point I was just thinking to myself "is this guy gonna unsettle the locker room?" I mean Phillips will be back soon, and Greer was doing a solid job of filling in except for the bad pass that allowed a goal a few games back, now both of these guys will be sitting on the bench so we can give games to a big hothead that we don't even own. As I've said plenty of times on here, the priority should he to get an attacking player on loan. That's what we need the most, and because most of the time substutions are used on attacking players, there are more opportunities to play or rotate attacking players. From the mistakes that are popping up, and the inability to finish, I'm wondering if there is some fatigue setting in. The squad is smaller this year. Now we play Mainz in a friendly tommorow! On one day rest! This is a game we don't need with league games coming thick and fast the next few weeks. It felt really good to get this win, but it very easily could have been a draw. The first substitution at 68 minutes (Armstrong for Maybin), a midfielder for an attacker, and a formation change to 4-5-1 says it all really. After having most of the run of play in the first half, and a fairly even start to the second half, I think this substitution is illustrative of us playing for a nil-nil. I thought the first half started pretty conservatively by both teams. Good defensive shape and long, over-the-top balls were the name of the game until the Switchbacks pinned Sacramento into their own third for much of the latter stages of the first half. In the second half the game opened up a bit more, with both teams having chances. With the game begining to go end to end, and our recent poor form, it's understandable that Trittshuh is more comfortable playing conservatively. He really doesn't have many attacking options, with the small squad and the attackers lacking confidence. It was absolutely incredible to see JJ Greer score the winning goal on the corner kick. Even before that, I thought he played a really inspired game. He played like a guy that will soon be 4th on the depth chart at center back that knows he shouldn't be there. It will be interesting to see how the season ends when Phillips comes back now with Greenspan here as well. Will there be a rotation, or will Greenspan get all the games? Greenspan will be back after suspension Wednesday vs Swope Park Rangers, and with Greer playing such a strong game, Trittshuh's decision on who to start will say a lot about how beholden he is to Bravo and the Rapids. Also, interestingly for those who didn't make the Mainz friendly, Badji and C. Doyle came down from the Rapids and played. So maybe something is in the works for the future? Badji would be a nice attacking option. Any new face right now would be a welcome addition attacking wise. Next up will be SPR on Wed. I saw them play a bunch in preseason and they were impressive; lots of talent. But like many young MLS 2 teams, they seem to perhaps need a bit more seasoning or experience, and I think they can be got at; especially early. The question is: Can our attackers get at them? Or will it be another tight, low scoring game? June 4th vs St. Louis was the last time SFC scored 2 goals in a game; 10 USL games ago or 12 games total. The glass half full perspective is that we are still in position to make the playoffs if we can get the offense going. Another positive is Maybin finally scored last night. Not just that he scored, but the way he scored. It was off of a nice cutback pass by Suggs. This type of pass has been altogether lacking this season. Last season the team was more capable of passing the ball quickly in the box to score goals or draw penalties, this season its just not there. I thought the last two games looked disjointed shape wise. It would appear Trittshuh is starting to throw shite at the wall and hoping it will stick with respect to changing lineups and movement of attackers on the pitch. I don't blame him for this, he can't do much if his players can't put the ball in the net, but I can blame him for the two recent loans from the Rapids. I've already said my bit about Greenspan, so I'll focus this on Connor Doyle. There's no doubt he's an impressive athlete, a physical specimen, and has some nice skills on the ball. But he is all over the place on the pitch, and while that seemed to impress some of the youtube announcers over the last two games, to me he was getting in other peoples space and negatively effecting the balance of the team. Roland Vargish (Switchbacks Color Commentator) seemed really impressed by him, and his "freelancing" role. But should a guy that has played in 90 something pro games and only scored 4 goals be able to roam the pitch as he sees fit? I would say not. Obviously I want our team to start scoring goals, but if we're pinning our hopes on Doyle his scoring history shouldn't fill anyone with confidence. Furthermore, the cynic would say that the Rapids have seen enough of these two to know they are not in their future plans hence them loaning them to us (a la Eloundoyu last year) before they are released. In that sense, it could be last chance saloon for Doyle. This is the lowest level of pro soccer he has played at and he better start scoring or creating goals. Any news on playoffs? Dates, etc? 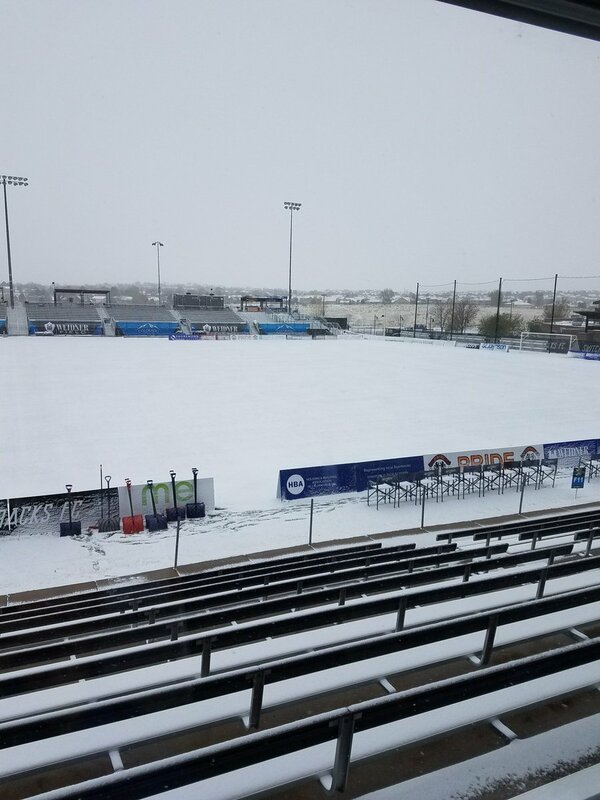 We need help clearing the field for tonight's match! Come down to Weidner Field & help shovel & receive a free ticket & concession voucher!